Argentine Ants are Most likely Near Your Home Making Their Way in. Argentine ants came to the US in the late 1890s from Argentina and Brazil. 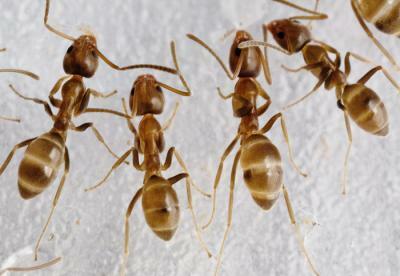 They vary in color and size from light brown to a dark brown coloration, and are about 1/8 inch in length (worker ants); queens size range from 1/6 to 1/4 inches in length. They can develop into huge populations with super large colonies of many nests which may contain hundreds of queens and thousands of worker ants. Predominant in the southern United States; found in Arizona, California, Illinois, Maryland, Missouri, Oregon, Texas, and Washington. near food and will invade homes in search for water. These eating habits are much like odorous house ants. They build unstable nests and move frequently; during very cold weather the argentine ant becomes dormant until periods of warmth. Say you are trying to implement a natural home ant control program of your own. NOTE: We have some of the most qualified ant killer and extermination professionals in the field and can be dispatched all over the State of Arizona although we are based in beautiful Scottsdale.